This office space has been refurbished to a modern standard and offers businesses a reliable place to work. Located literally on the River Thames, this Business Centre has easy access to the underground and mainline train stations. There is a staffed reception and seating area as you enter the building and a good selection of boardrooms that are available to hire when required. 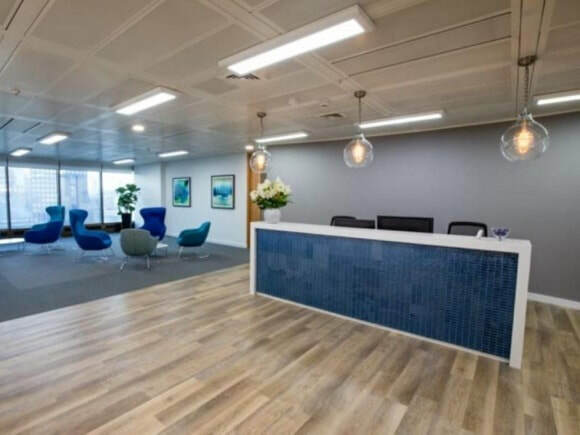 With great views from many suites, this property has a broad choice of offices for rent, which are ideal for companies that rely on upgrading and downgrading. Whether organisations need standard broadband or fast broadband, this serviced office to let can supply various packages to suit a preferred bandwidth preference. Features at the site include telephone answering, break areas, kitchen facilities and free furniture.